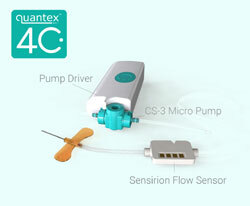 At this year’s MD&M West trade fair (Anaheim, United States), the sensor expert Sensirion and Quantex Arc Ltd will be presenting an innovative concept study in the field of infusion technology – Quantex’s new wearable drug delivery IoT Platform “Quantex 4C”. One of the hallmark features of Sensirion’s products is the use of its patented CMOSens® Technology, which permits intelligent system integration of the sensor element, logic, calibration data and a digital interface on a single chip. Sensirion's credentials as a reliable supplier are emphasized by its quality certification (ISO/IATF 16949) as well as its loyal and renowned customer base.